As marketers, obsessing over customer relationship management (CRM) is pretty much what we do. We want to know how our customers feel, what they want, and what they think of our companies, and we want to know this ALL THE TIME. But since the rise of the web, search engines, and social media, the channels for doing this have fundamentally changed. On the surface, this means that our day-to-day tasks have started to focus primarily on planning for and analyzing multi-channel campaigns. But, at a deeper level, we are shifting from being the mouthpiece for the products and services our businesses sell to being conversation starters, think tanks, entertainers, community builders, and idea hubs. We are becoming, in essence, members of the new media. Now, I don’t mean that in the way people used to sling that term around in the early 2000s, when we barely knew what the web was. I mean it in that media has changed from being a one-way street to something more circular in nature; something where content producers create the media, audience members create their own content in response, content producers respond, in turn, and so on and so forth down the line. How do we use CRM now? The obvious answer is that we use CRM in every place we can think of. 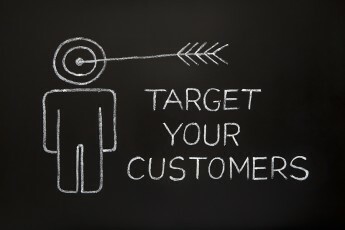 We use CRM to create compelling e-blasts. We use it to get our company listed at the top of search results. We use it to create a constant and consistent presence on social media. And we still use it in those old fashioned ways — reaching out to customers over the phone and through direct mail. It follows that the way we measure our CRM efforts is also a blend of old and new. We analyze the data from surveys and gather information about how we’re being found, while still tracking click-through rates (CTRs), bounce rates, conversions, and so forth. By and large, most of us still use these channels to get the word out about the brands we represent and to let customers know about contests and deals, while also using newer tools to have a real conversation and to respond to comments, compliments, and complaints in real time. How does content fit into the equation? On top of these other CRM efforts, most marketers and businesspeople have at least heard that content creation should be a part of their marketing efforts. But too often, there seems to be a struggle to shift from a purely sales mentality to something that’s more like that of a media producer. For example, many businesses tweet only about their services. They bombard customers with promotional e-blasts. They look for quick wins, failing to ask “why” in their content creation, or to engage customers by answering burning questions. In short, they fail to be irresistibly shareable. Many also get too eager, casting far too wide of a net in hopes of capturing more customers, even though this is violating one of the main principles of CRM: know your customers. Just like in sales, you can’t appeal to anyone’s content needs when you’re trying to cater to everyone. It’s becoming increasingly evident in Google’s own research and elsewhere that social media is driving more traffic than direct search is. This matters to content marketing, as social media shares are one of the primary ways that customers find and engage with what we produce. 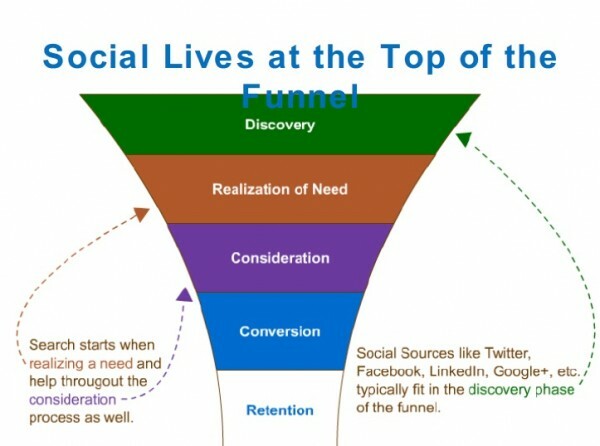 As you can see below in the conversion funnel (which should remind you of classic sales and CRM funnels), social media is now the primary method of “discovery,” which explains why businesses are upping the ante in order to reach social success. But, as I mentioned previously, the “realization of need” comes less from sales materials than it does from the content itself. More people are sharing content online than ever before, indicating a desire not for ads, but rather for media that gets them thinking and creating. Customers are commenting, remixing, and rating, and they’re talking about content on social media. They’re engaging in a way that’s entirely unprecedented in our formerly linear production model. This connects to CRM in a real and tangible way. CRM tools can help a company get to know the audience that will be consuming the content it creates in the same ways it can help a company identify and target its customers (and that is what all content consumers are — customers who are at some stage of the conversion funnel). This will help content marketers define goals and unique selling proposals (USPs), which in turn will help us determine what kind of content to produce and at what times it will be the most relevant to deliver it to our audience. CRM tools can also help us determine what kind of metrics to use, which in turn will allow us to understand what kind of impact our content and content distribution strategy are having. The data we receive from CTRs, conversions, etc., can make even the most agile A/B testing more informative, which allows us to test out different voices, styles, and even topical preferences. Want to know something more? Content marketing plays into CRM, too. We create new content and, boom, we attract new potential customers. What do we do with them? By having a CRM solution in place and making sure there is a two-way street between the two, we know what to do with these new leads and can keep track of the relationship that grows. In this continuous cycle, the more we know about our customers, the better able we’ll be to produce compelling, relevant content — whether that’s white papers, funny or moving videos, games, how-to articles, e-Books, case studies, you name it. Likewise, we’ll be able to effectively track the leads that come in through our content. In essence, we can use these tools at every stage of content production and promotion, fully unlocking content’s potential as a primary tool for creating continuous customer engagement, as well as for increasing brand likability, familiarity and trust and, ultimately, sales. One look at this Volkswagen video and it should be clear that the worlds of marketing and advertising are changing in fundamental ways. Both the principles of good CRM and good content are written all over this. Rather than appealing to its customers in a way that’s obviously related to its product, Volkswagen clearly used its understanding of its customers’ psychological and emotional makeup as a path towards engagement. It used this knowledge (this data) to create an ad that’s new, interesting, likable, stimulating, and entirely relevant to its audience. Sure, only a small percentage of those 17.7 million views (and counting) will convert into customers, but some will, and when you’ve reached a large audience like that, “some” is a lot of revenue. And I’d bet money that Volkswagen knew what to do with these new leads once it captured them. Or, look at the site for Slavery Footprint, which makes the problem of modern slavery real and tangible to users, not by hiring a celebrity to lecture at them, but rather by engaging them in a game that manages to be interesting and to appeal to the emotions without making light of the problem. See the CRM? There’s no way the creators of this website could have been so creative without first gathering data about its demographics, determining strategies for broadening that base, and then, once it was launched, generating leads through social media. So, how can we all use CRM principles in our content production? Monitor clicks, comments and traffic on the content you create. Use this data to create future content, determine the most effective promotional channels and publishing tools, and get content to the right people at the right time. Be versatile. Multi-channel platforms give you access to different media genres. Get creative, using this wide range of content tools and techniques to create something unexpected, compelling and new. Track user engagement. Know who, what, when, where, why and how people are engaging with your content, and use that knowledge to create better content that will further boost engagement. Use data collected with your CRM to manage and communicate with customers, track their preferences and target them accordingly. Most of all, change your mentality. Think of CRM as the tool that helps you get creative with content, which will in turn improve your CRM. There’s a brave new world out there, one that rewards energy, creativity and authenticity. So drop the tactics, make friends with your customers, and have a little fun. Adria is the Head of Outreach at a creative internet marketing agency. When not connecting with interesting people on the web, you can find her writing about style at her personal fashion blog The Emerald Closet. Follow her on Twitter @adriasaracino and stay in touch.